If you’ve spent any time in the Nashville Music Scene, you’ve likely crossed paths with Caroline Bowman, whether it is one of her shows as part of the Palaver and Cold Lunch family, or just as a fan and advocate of local bands. We first got to know her as a photographer and contributor for No Country several years ago, and have since watched her pursue her passion with an unbridled zeal. News recently spread across town that she has been diagnosed with Guillain-Barré Syndrome, which is an inflammatory disease of the peripheral nerves outside the brain and spinal cord, and, while we are happy to report that Caroline is out of the hospital, that doesn’t mean that the bills haven’t stopped piling up while she has been out of work. So what do we do in Nashville to help one in need? Throw a big ol’ show to help out. 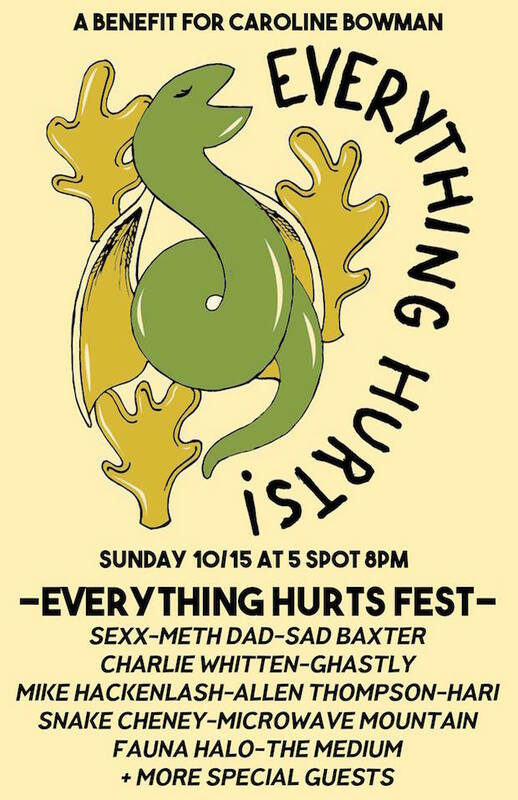 Head out to The 5 Spot this Sunday, Oct. 15 for a massive lineup featuring a ton of blog faves, like Sad Baxter, Allen Thompson, HARI, Meth Dad, Fauna Halo, Charlie Whitten, The Medium, SEXX, Microwave Mountain, and more. The 21+ show starts at 8 p.m., and a $10 donation is suggested at the door. Full details are available on the Facebook event page. If you can’t make it to the show, you can still do your part to help the cause by donating to a GoFundMe in Caroline’s honor, and, if you donate more than $30, you’ll be able to snag a commemorative t-shirt at the show. Head below to see the official event poster, and to get a peek at what that t-shirt will look like. 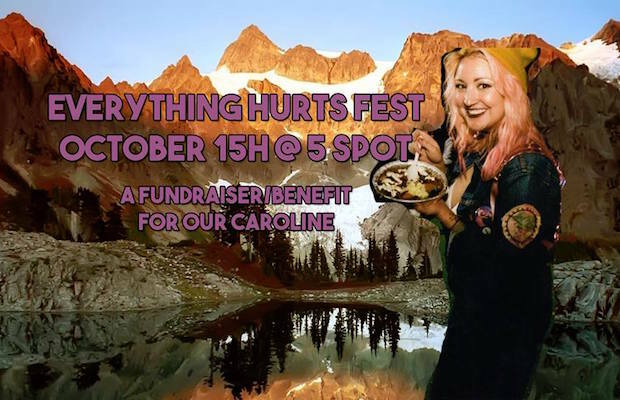 Everything Hurts Fest Benefit for Caroline Bowman takes place Oct. 15 at The 5 Spot. The show is 21+, begins at 8pm, and $10 is the suggested donation.